On March 14th, the 2019 People's Postcode Lottery Charity Gala was held at the University of Edinburgh's McEwan Hall. The annual Gala celebrates the important work done by the charities that are supported by the players. At the gala it was announced that more than £100 Million was awarded to charities and good causes in 2018 - thanks to players of People’s Postcode Lottery. In total, they have now raised more than £404 Million. 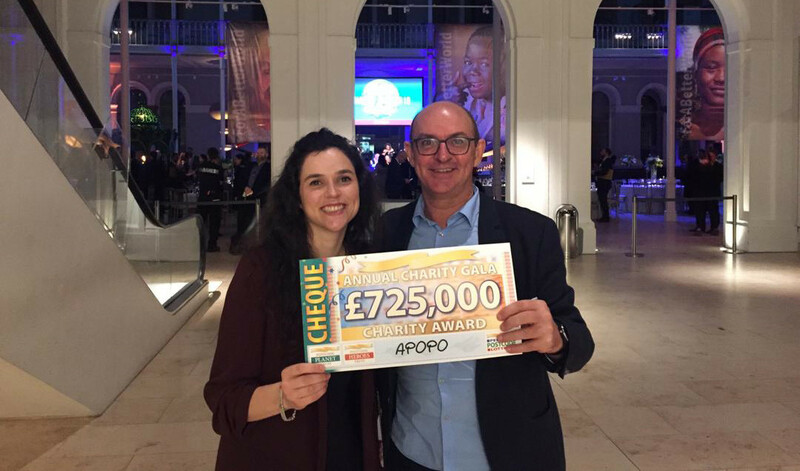 Among those receiving an award at the gala were our CEO Christophe Cox and APOPO Swiss Foundation Director Anna Bouchier who were honored to receive a cheque for £725,000 to support APOPO's work in landmine and tuberculosis detection. "We are humbled and grateful to players of People's Postcode Lottery for their generous ongoing support of our projects. The hard work and achievements of our dedicated staff around the world are made possible with the backing of players of People's Postcode Lottery. This award will allow APOPO to create lasting change in some of the world’s most vulnerable communities." said Christophe Cox, CEO of APOPO. Other notable guests at the Gala event were George and Amal Clooney, who were presented the prestigious Postcode Hero awards in recognition of their work to safeguard human rights. People's Postcode Lottery manages multiple society lotteries promoted by different charities. It costs £10 a month to play and winning postcodes are announced every day. 32% from each ticket helps fund charities all over the world including APOPO.